WE’VE SPENT 10 DAYS UNDER A PRE-EVACUATION NOTICE DUE TO THE CEDAR FIRE HERE IN ARIZONA. THAT’S 10 DAYS OF WALKING AROUND A PILE IN THE LIVING ROOM INCLUDING THINGS WE’D NEED TO GET OUT. THE FIRE WAS LOCATED ABOUT 9 MILES SOUTH OF TOWN, BURNED 46,000 ACRES, AND HAD 974 FIREFIGHTERS WORKING THE FIRE. US HIGHWAY 60 TO PHOENIX IS STILL CLOSED TO TRAFFIC. DEPENDING ON WHICH WAY THE WIND WAS BLOWING WE HAD ASH FALLING LIKE SNOWFLAKES, AND AT TIMES THICK SMOKE. AT TIMES WE STAYED CLOSE TO THE INTERNET AND THE HAM RADIO FOR INFORMATION AND UPDATES. THE FIRE IS 51% CONTAINED AND WILDFIRE WARNINGS WILL NEXT TURN TO FLOOD WARNINGS DOWNHILL FROM THE MOUNTAIN, AS THE MONSOON SEASON GETS UNDERWAY. MARY AND I WILL BE REWORKING THE PILE IN THE LIVINGROOM AS WE WILL BE GOING ON VACATION DURING JULY. 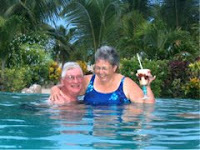 MARY WILL BE IN THE LA CROSSE, WI AREA AND REX IS HEADED TO DAYTON, OH TO SPEND SOMETIME WITH AIM AND THE GRANDSONS. MY PROJECT HAS BEEN TO TAKE APART MY OUTSIDE PARK BENCH, SAND IT ALL DOWN, AND PUT A NEW FINISH ON IT. THE BEFORE HAD A SPAR URATHENE FINISH WHICH I SANDED OFF AND THE NEW FINISH IS AN OIL STAIN FINISH. WE WILL SEE HOW IT HOLDS UP DURING THE MONSOON SEASON. MY NEXT PROJECT IS NEW FLOORING IN WHAT WE CALL THE BASEMENT, WHICH IS A DUG OUT AREA UNDER THE CABIN. WITH ALL THE WATER PROBLEMS THE FLOOR IN THE WALKWAY, MADE OUT OF CHIP BOARD, ROTTED AWAY. THE WEATHER HERE IS “SUNNY & SMOKEY”. WE HAVE A WILDFIRE JUST SOUTHWEST OF SHOW LOW. THE LAST COUPLE OF DAYS WE’VE BEEN IN A PRE-EVACUATION MODE. ABOUT HALF THE RESIDENTS OF THE RV PARK HAVE RETURNED TO THEIR PERMENANT HOMES IN THE VALLEY. WE HAVE A PILE IN THE LIVING ROOM TO LOAD INTO THE CAR IF THEY GIVE THE EVACUATION ORDER, BUT HAVE DECIDED TO STAY SO FAR. THE WEATHER FORCAST AT LOWER ELEVATIONS IN ARIZONA THIS WEEK-END IS 120 DEGREES. I SEE IT’S BEEN A WEEK SINCE I PUT A BLOG UP, SO WHAT HAVE I BEEN DOING THE LAST WEEK? IT WAS ACTUALLY KINDA WARM (90’S) AND THE CATS AND I JUST SHUT DOWN IN THE HEAT, WHICH MEANS WE ALL THREE SPENT A LOT OF TIME SITTING ON THE PORCH READING AND LISTENING TO THE HAM RADIO. I DON’T THINK THE SCOOTER WAS OUT OF THE TRAILER EITHER. MY CURRENT PROJECT IS TO REFINISH OUR OUTDOOR PARK BENCH. WHEN I TOOK IT ALL APART THERE TURNED OUT TO BE 16 WOOD PIECES. THE THREE METAL PIECES ARE IN GREAT SHAPE AND DON’T EVEN NEED TO BE REPAINTED. OUT OF THE 16 WOOD PIECES I HAVE 12 SANDED AND RESTAINED. I SPENT A COUPLE OF HOURS EACH MORNING IN THE COOL AND SHADE WORKING ON THAT PROJECT. THIS NEXT WEEK THE WEATHER IS TO RETURN TO REGULAR MOUNTAIN CONDITIONS (SUNNY & 80) AND SINCE MY NEW NEIGHBOR UNLOADED A HARLEY YESTERDAY, I’M GUESSING THE SCOOTER WILL GET SOME MILES ON IT. TODAY WAS THE ANNUAL CORPORATE MEETING OF TALL PINES RV PARK, WHERE WE LIVE IN THE SUMMER TIME. MARY AND I ATTENDED AS WE ARE 1/64 OWNERS OF THE CORPERATION. IT WAS INTERESTING TO LEARN HOW OUR FIVE PERSON BOARD OF DIRECTORS RUN THE PARK, WHICH WE BOTH AGREED THEY DO VERY WELL. THE BUSINESS MEETING WAS FOLLOWED BY A POTLUCK BRUNCH. I WAS AMAZED THAT ONE OF THE PONDS NEEDS TO BE CLEANED OUT AFTER 36 YEARS AT A COST OF $30,000.00 AND THERE ARE FUNDS AVAILABLE TO COMPLETE THE PROJECT WITHOUT A SPECIAL ASSESMENT. FIRST, A LOOK AROUND THE YARD THIS MORNING. WE HAVEN’T IDENTIFIED THESE PRETTY BLUE FLOWERS THAT COME UP EVERY YEAR ON THEIR OWN. WE LIKE THEM SO WELL THAT WE DUG SOME OUT OF A DITCH BEHIND HOME DEPOT. FOR ALL WE KNOW IT’S A WEED? WHEN HEATHER WAS HERE HELPING HER MOM WITH PLANTS SHE BOUGHT THESE MINNESOTA VIKING PANSYS TO MAKE FUN OF MY GREEN AND GOLD BLOOD. THOUGHT I’D POST A PICTURE TO SHOW HOW WELL THEY ARE DOING. JUST REMEMBER BESL’S THEY ARE PANSYS. HAMFEST IN THE WHITE MOUNTAINS IS AN ANNUAL JUNE EVENT AND STARTS AT 6AM. ACTUALLY THE RV’S ARE ALLOWED TO PARK OVERNIGHT AFTER 5:30 PM THE NIGHT BEFORE. DOOR PRIZES, VENDORS, AND FOOD. DID I WIN THE GRAND DOOR PRIZE? NOPE. GOOD THING, IT WAS AN HF RADIO, AND I WOULD HAVE HAD TO BUY A BOOK AND TEST TO UPGRADE MY LICENSE IN ORDER TO USE IT. SHOULD BE NEW ORANGE PANSYS, BUT OVER NIGHT SOMETHING (SQUIRRELS, RABBITS, HAVALINAS) DUG THEM UP AND ATE THEM. SHOW LOW DAYS IS A NICE OUTDOOR ACTIVITY WITH MUSIC, VENDORS, AND KIDS RIDES. I LIKE IT BECAUSE IT’S HELD AT THE PARK ON THE BALL DIAMOND, AND IT’S KINDA NICE TO SIT IN THE BEER TENT WITH LUSH GREEN GRASS UNDER YOUR FEET. HERE THE COWBOYS WERE PERFORMING ON THE INFIELD IN FRONT OF THE STAGE. MT BALDY IN THE WHITE MOUNTAINS IS ONE OF THE MOST SACRED MOUNTAIN TOPS TO THE APACHE INDIANS. CALLED MT BALDY BECAUSE AT 11,904 FEET THE TOP IS ABOVE THE TREE LINE GIVING THE SUMMIT A BALD LOOK. THE SUMMIT IS ON THE APACHE INDIAN RESERVATION AND YOU MUST HAVE A WRITTEN HIKING PASS TO CLIMB TO THE TOP. WE HAD THE SCOOTER OUT TO REACH THE TRAILHEAD. THE 25 MILES THRU THE APACHE-SITEGRAVES NATIONAL FOREST AT 55 MILES AN HOUR AND 77 DEGREES TODAY WAS MUCH MORE ENJOYABLE THAN ON TUESDAY AT 52 DEGREES AND RACING THE RAIN AT 75 MILES AN HOUR. WE ONLY HIKED IN ABOUT A MILE, AT 9200 FEET IN THE PARKING AREA WE WERE BOTH HUFFING AND PUFFING IN JUST A MILE AND RETURNED TO SCOOTER RIDE INSTEAD OF HIKE. WE DID 92 MILES ON THE DAY, AND HOPEFULLY OUR BUTTS ARE GETTING IN SHAPE. HAD THE SCOOTER OUT YESTERDAY AS WELL, BUT THAT WAS JUST AN AFTERNOON TAVERN RUN DOWTOWN SHOW LOW. HERE COMES A BUSY WEEK-END WITH SHOW LOW DAYS, HAMFEST, AND COCKTAILS SATURDAY AFTERNOON.